Thank you for visiting the homepage of the ICCRA! 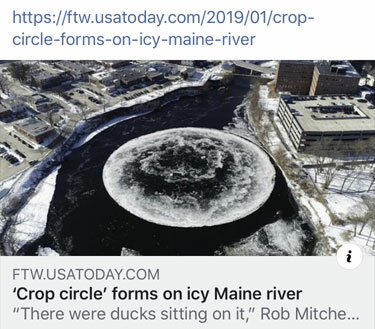 In an amazing quirk of nature, an ice circle with roughly the diameter of a football field formed in the Presumpscot River in the city of Westbrook, Maine, and a man captured time-lapse video of the circling ice. “It kind of looks like a crop circle,” Doug Bertlesman told the Portland Press Herald. “It’s pretty wild to look at. It’s certainly not every day that you can watch a spinning circle of ice in the river.” Visit the USAToday site for more of the article and video. ICCRA Members can now meet on Facebook! Welcome to the official website of the Independent Crop Circle Researchers' Association [ICCRA]. This website is designed to serve crop circle researchers and members of the general public who have an interest in crop circles - specifically in American crop circle formations - with as much of the information about USA crop circles (and crop circle research in general) as we can freely provide. 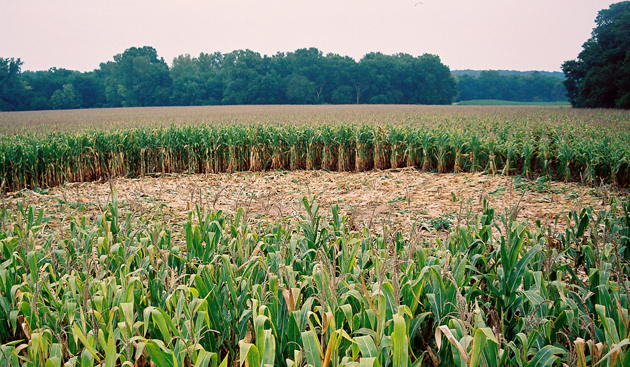 The ICCRA, as an organization, is dedicated to cooperative and collaborative, objective research about crop circles amongst a variey of interested researchers. On these web pages you will find a repository of the investigative field reports of the crop circle formations that members of the ICCRA have investigated personally, as well as an historical archive of additional crop circle formations that have been reported in the United States of America from nearly all fifty states dating back to the 1800's. You will find summary statistics about USA crop circles, as well as explanations of crop circle investigative techniques such as the L-NEAT, and other methods and tools used in researching crop circles in the fields. This site also serves as a repository for all of biopysicist W.C. Levengood's Pinelandia Labs crop circle research reports and his additional published scientific papers and patents. For anyone with a serious interest in understanding the details about crop circle formations, we hope that you will find those details within this site, but feel free to contact us or contribute additional information if you know that we are missing information, or that we have made a mistake. We are trying to be as complete, as accurate, and as thorough as possible in providing the information herein. Huge thanks go out to all the crop circle researchers, farmers, and landowners who have contributed this material or granted permissions along the way! Above all though -- ENJOY! Check out the other events to see ICCRA at! If you wish to report a crop circle please contact us.